This is considered a health drink in Thailand, it’s supposed to be good for cleansing the stomach and helping digestion. You can see Bael fruit here, it’s available dried in packets from Asian grocers. Serve warm or cold. 1. Boil the water in a pan. 2. Add the matoom and continue simmering for 15 minutes. 3. Add the sugar and stir until dissolved, adjust the sweetness to your own tastes. 5. If you want iced tea, chill it in the fridge and serve over crushed ice. 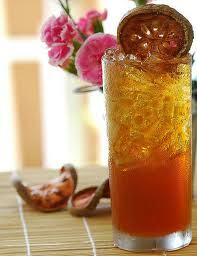 For iced tea, it is better to slightly over-sweeten it, as it won’t taste so sweet when it’s cold.